Ken Parker shows off the green in front of the new clubhouse at Hidden Lakes. Golf is not exactly a reassuring endeavor. It's one of those "just when you thought you had it figured out" kind of things. Your driver is working. Your putter quits. Your short game shines. Your woods go AWOL. Friday everything works. Tournament Saturday comes, and nothing, absolutely nothing, works. Well, not this year; at least, not around Sandpoint. Both local courses, the Elks and Hidden Lakes, took the plunge into new looks this year; new clubhouses and new layouts. At the Elks, the course has rotated four holes counterclockwise. Six became One, One became Five, Five became Nine and all other numbers became other numbers. The good news is that the course plays in the same order. In the midst of it all, a new 6,700-square-foot Elks' Club lodge has been built, with bar, banquet room and pro shop. 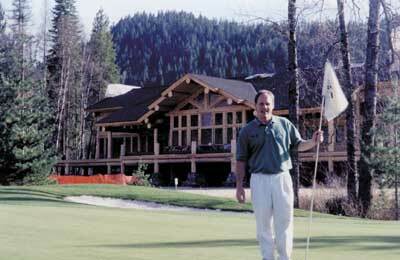 The Sandpoint Elks' Club has leased the nine-hole course just east of Sandpoint to Tom Tharp for the past 14 seasons. With the decision to build a new clubhouse on the course came the decision to manage the course themselves. They hired Jim Milligan as the pro and asked Tom to become the course superintendent. Rounding out the staff is clubhouse manager Miriam Ownbey, brought on board last fall to run the food and beverage operation in the new club house. At Hidden Lakes, the course was dismembered and reassembled. Six became Five. Five became Two. One became Fourteen. Nine, one of the easiest par-four holes on the course, traded numbers with Thirteen, one of the hardest. Four, Fourteen, Fifteen and Sixteen disappeared, and four new holes rose out of the forest; One, Ten, Seventeen and Eighteen. The course does not play in the same order. However, the new holes are good -- very, very good. Designed by John Mueller of Hatch Mueller, P.C. and constructed by Bernhardt Golf of Beaverton, Oregon, each is a showpiece in itself, especially One and Eighteen. All four fit into the old course and add that extra stroke to bring Hidden Lakes' rating up to a par 72. Director of Golf Ken Parker gives the new layout two thumbs up. "The new course is better than the old layout. We lost Fourteen and Fifteen, the two weakest holes on the course, so the overall challenge is greater, but the new opening hole is considerably easier than old Number One. It will make the course more fun to play." holy cow! Well, maybe "Holy moose!" would be a better way to put it; 17,000 square feet of log, native rock and glass looking out on Pack River and the Cabinet Mountains. The best descriptor for the public portion of the lodge might be "massive," with a two-and-a-half-story stone fireplace on each end of one huge room that encloses the pro shop, lounge and an 88-seat restaurant. In your imagination, add moose-antler chandeliers, skylights, exposed log walls and a monstrous tree trunk with a carved moose head growing out of it. If you are having trouble imagining it, that's understandable. The only way to really understand it is to go see it. The pro shop moved from the old clubhouse to the new on May 15. The restaurant opens to the general public on June 11 under the direction of Chef Paul Donaghue. Donaghue comes to Hidden Lakes from the Café Rosemary in Bend, Ore., which was named "Best in the Northwest" by Gourmet Magazine. It's doubtful that the changes at the Elks' and Hidden Lakes will improve your golfing, though it may make the overall experience better. They've changed the way both courses play, not good for the easily confused, but they have also built some really beautiful places to recover from the rigors of the game. In case you would like to explore the lies of other area golf courses, following is a list of the closest. Garfield Bay (on Garfield Bay Road south of Sandpoint) gives players nine holes laid out on a hill-side hayfield. The Ranch Club (just west of Priest River on Highway 2) has nine well-kept holes and a new driving range. (208) 448-1731. Mirror Lake (just south of Bonners Ferry on Highway 95) is a nine-hole course with different tees to play 18. Seven out of nine fairways slope; add water to some for lots of challenge. (208) 267-5314. Stoneridge at Blanchard is closed for the season and will be rebuilt for next year. (208) 437-4682. Priest Lake (just west of Priest Lake on Highway 57) features nine beautiful holes in the hills. (208) 443-2525. Sandy Compton recently went to Russia, but he didn't get to golf there.